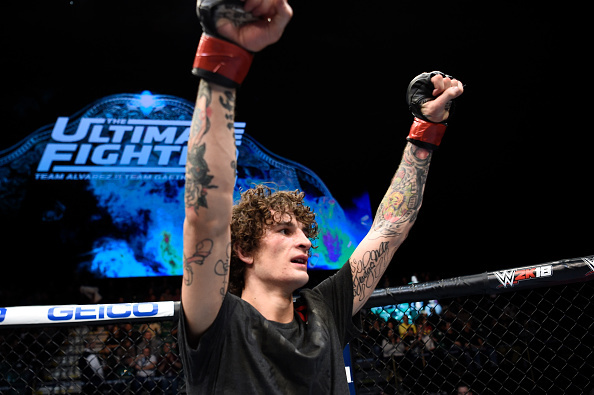 The last time we checked in on Sean O’Malley, the director of “The Sugar Show” didn’t believe there was a target on his back placed there by fellow bantamweights who were intently watching his rapid rise in the public eye and wanting to put an end to that ascension. Now, he’s gone from Dana White’s Tuesday Night Contender Series to the UFC to a UFC Pay-Per-View card. Has his answer to that target on his back question changed? If there’s a 23-year-old as cool under pressure as O’Malley is, he or she is hiding out somewhere. There apparently is no way to rattle the Montana native, and that was evident in his Octagon debut, as he held off a spirited effort by Terrion Ware to win a hard-fought unanimous decision. For a lot of hot prospects, when the reality sets in that they can’t knock everybody out, the wind leaves their sails and it opens the door for an unexpected loss. But when faced with adversity, O’Malley looked like he was having a ball. Next up is Rhode Island veteran Soukhamthath, who had a rough start to his UFC career when he lost a pair of split decisions, but he took the judges out of the equation in fight three, as he halted Luke Sanders in the second round. He’ll bring that momentum into this weekend’s bout, but O’Malley expects to put that to an end fairly quickly. This is the same Sean O’Malley who began training in order to become self-confident, right? Guess that’s working out. “It worked out perfectly,” he laughs, admitting that he doesn’t even remember that teenager he once was anymore. These days, being different from everyone else isn’t something to be ridiculed, but celebrated. And according to Mr. O’Malley, you ain’t seen nothin’ yet.